In an aquarium, fish are obviously kept together at a higher density than they would be in the wild. This inevitably leads to a build-up of their waste which, over a period of time, would be harmful and ultimately even life-threatening to them. The purpose of filtration is to clean the water and assist the natural decomposition of waste (including other organic matter such as uneaten food), so that the fish remain in good health. The most basic filter is the undergravel (UG) type, which fits on the floor of the tank with the substrate gravel on top. This method of filtration is purely biological and relatively low maintenance; unlike with a media filter, there is no need to change any filter wool. 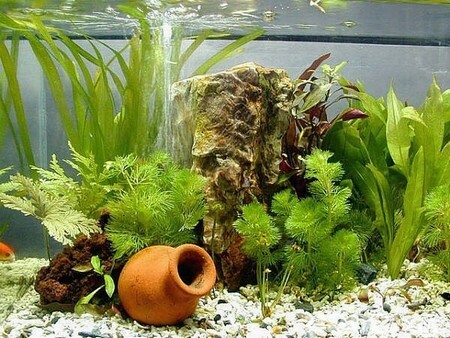 Occasionally, the gravel should be stirred to freshen up the filter bed and remove any large particles of detritus that have congregated on the surface. Numerous holes or slits along the length of the filter allow water to pass through the filter plate, but the filtration process itself actually takes place in the gravel. Here, beneficial aerobic bacteria become established and they act on the fish’s waste and any uneaten food, turning it into a nitrate compound. Being aerobic, these bacteria require oxygen, so the substrate itself should be relatively coarse, allowing water containing oxygen as well as the fish’s waste, to pass through the filter bed. If the particles are too small, or the bed is very shallow, this will adversely affect the action of this type of filter. For maximum efficiency, the UG filter should cover the entire base of the tank. The filters are produced in a range of sizes for this reason, but if you have an unusually shaped aquarium, then you can cut the filter to fit accordingly, using a sharp modelling knife. With a standard UG filter, the water passes down through the filter bed, being drawn through the base and returned to the tank via the uplift – this is the plastic tube fitting at one corner, powered by an air pump which is left running constantly. These pumps are very inexpensive to operate and the current models are generally quiet in operation. Some fish-keepers prefer to opt for a reverse flow UG filter, however, which requires an external canister filter as well. This also acts as a pre-filter, with water being drawn out of the aquarium, and passing through the canister, before being passed back via the airlift, down into the base of the UG filter. It then moves up through the substrate, which is why this system is described as reverse flow. The passage of the water via this route helps to prevent any blockage of the filter bed, but it does mean that there is relatively little movement of water at the surface, which is also important to ensure an effective interchange of oxygen and carbon dioxide. Canister filters, unlike the undergravel type, combine biological filtration (from bacteria) with chemical and mechanical filtration. This all takes place within the canister, which contains a filter medium, such as filter wool. This traps particles of dirt within its fibres, while allowing easy passage of the water. Beneath this wool, there is usually a layer of activated carbon (not to be confused with ordinary charcoal). Its open granules have a very large surface area, so it takes up impurities from the water directly, providing chemical filtration. It also supports a large colony of aerobic bacteria, which act like those in the UG filter bed. 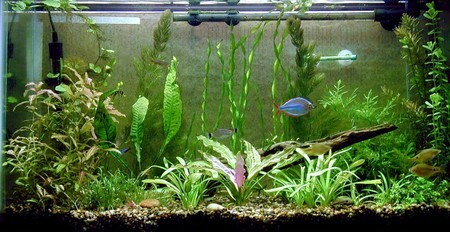 Be warned that carbon should not be used in an aquarium containing medication, since it will inactivate the chemicals. Some remedies may also trigger the sudden release of harmful material held in the carbon back into the water. You will need to change the filter wool regularly so that the filter continues to function effectively. It is worth calculating the cost of filter media in advance, to give you an indication of the likely running costs, which can start to mount up over time. Do not be tempted to economize by using other, non-specialist materials such as cotton wool in place of the filter wool, since these may well be harmful to the fish. When setting up a new aquarium, bear in mind that biological filtration will take several weeks to be effective, because the bacteria need time to become established. You can speed this process by adding sachets of a compound called zeolite to a canister filter. This natural resin provides a further means of removing ammonia from the aquarium by chemical means, before it can prove harmful. Zeolite sachets can be regenerated easily by immersion in salt water overnight. On occasions, especially with fish that require soft water conditions, granulated black peat can be added to the canister filter. The peat is a valuable source of minerals and other compounds as well as humic acid, which lowers the pH; it benefits both fish and plants, and has a mild disinfectant action. In this recently developed system of filtration, water drawn from the aquarium trickles down through a series of trays filled with filter media. This raises the oxygen level of the water, improving the efficiency of the aerobic bacteria in the filter beds. It is also quite simple to improve the level of filtration by increasing the number of trays in the stack, but there is a drawback in that they take up a relatively large amount of space. The size of the aquarium, and the number and size of the fish, will obviously influence the size of the filter you need. An internal filter, filled with filter media, is located within the tank, and is generally only suitable for a small set-up. External filters may be free-standing or attach to the side of the aquarium on the outside, and obviously have a larger capacity. In the past, box filters were favoured, driven by an air pump, but today external canister filters or power filters that incorporate their own motors are more widely used.